Have a hassle-free transfer from Jodhpur to Pushkar on a comfortable private cab. Enjoy a hassle-free transfer from Jodhpur to Pushkar on a comfortable chauffeur driven vehicle. Available on easy online booking. Pushkar is a city in the northern state of Rajasthan, it borders the Thar desert. It's set on Pushkar Lake, a sacred Hindu site with 52 ghats (stone staircases) where pilgrims bathe. The city of Pushkar is dotted with temples among which the 14th-century Jagatpita Brahma Mandir, dedicated to the god of creation, which has a distinctive red spire and walls inlaid with pilgrims’ silver coins. Overall Pushkar is a lively city on the western side of the Aravalli ranges. 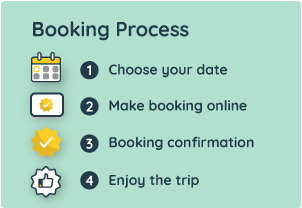 Your transfer begins with a pick-up from your hotel/airport/bus or railway station in Jodhpur city limits at your specified time slot (select while booking). You will be travelling a distance of about 190 km from Jodhpur to Pushkar. And it would take you about 5 hours to reach Pushkar inclusive of your stops for refreshments. Upon your arrival in Pushkar, you will be dropped at your hotel/airport/bus or railway station in Pushkar city limits.